Budco is a stocking distributor of fixed length security seals. 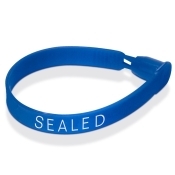 We stock fixed length security seals such as Plastic Truck Seals, Trailer Seals and Tote Seals. The fixed length security seals are a cost effective secure way to provide tamper evident security to multiple security seal applications. We can also supply custom fixed length security seals to meet you barcode and/or custom imprint needs.